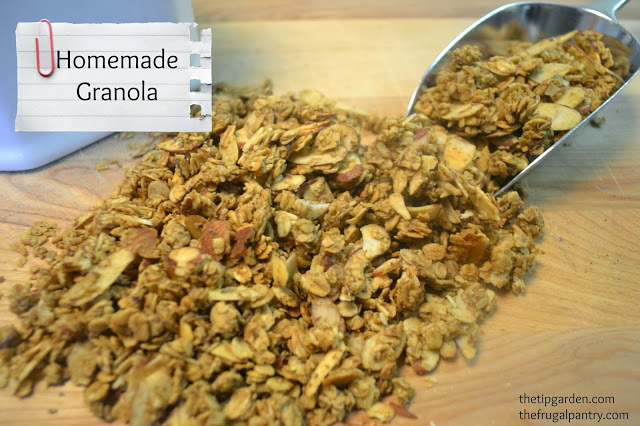 My children's all time most requested homemade item to be sent in a college or Christmas care package is a batch of homemade granola. I've made it a lot over the years and it's easier than you think! 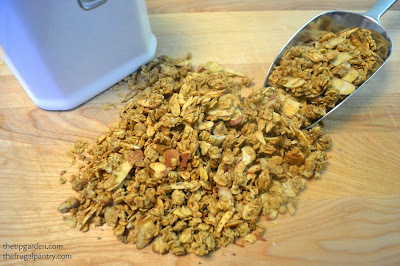 The key to granola is to have the right ratio of dry ingredients to wet ingredients. You get to choose the ingredients, but just need to get the ratio right. Rather than a specific recipe I am going to give you the ratio's and options for both dry and wet ingredients to make your own. the ratio's are a general guideline. You don't have to be exact, but you do need to come pretty close. Have fun playing around with it. I tend to make a ginormous amount since I send it out in bulk to my kids or use it as a nice gift from the kitchen to friends. My family is not as adventurous as I am in granola so they like it simple, and I have found that when giving it as gifts, it's best to leave out the dried fruits, seeds, or coconut since taste preference vary so much. Ok lets' get you started. The ratio is 8 cups of dry for every 1 cup of wet ingredients. BUT... from the wet ingredients you need to divide it between a binder and a sweetener. The binder helps to hold the granola into nice little bite sized chunks. The sweetener... well you know what that is for. I'll give you options for both below. For the dry ingredients, I usually use about 6 cups of oats and then up to 2 cups of other dry add-in's but it's totally up to you. In large bowl add in oats. Stir in all dry ingredient add-ins Mix well. In sauce pan on stove add in one cup water plus your choice of binder and sweeteners. Heat over medium low heat till liquid is blended, and if added in sugar is dissolved. Pour wet ingredients over dry ingredients and mix well to combine. Spread mixture onto several cake pans or cookie sheets with sides. Bake 20-30 minutes, stirring at the 10-15 minute mark. Store in cool airtight container. How did I make my exact recipe above? Although I generally "wing it" with what I have on hand , here is the exact amounts I used today. Reminder this is not an exact science, so just try to keep the ratio pretty close.